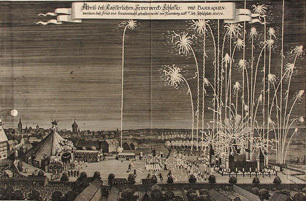 HCB was at one time used in fireworks manufacturing. Hexachlorobenzene (HCB) is an organic chemical formerly used as a fungicide and in the manufacture of fire works and ammunition until 1965 when its use was banned in the United States due to environmental and health concerns. It breaks down very slowly, and bioaccumulates readily in plants and animals. HCB may arrive in water through sediment that has adsorbed it. Some people who drink water containing hexachlorobenzene well in excess of the maximum contaminant level [0.001 milligrams per Liter] for many years could experience liver or kidney problems; reproductive difficulties; increased risk of cancer. The EPA recommends granular activated carbon (GAC) for the treatment for HCB.